My translation “The Feast” is a little interpretive leap from the literal title of today’s surah, al-Maa’ida (“the table”). The understood meaning is a “table spread with food,” and honestly that is quite a wonderful title for this chapter. In the most literal sense, part of the Surah’s objective is to spell out what kinds of foods Muslims are allowed to eat. There is also a story of God sending a feast from heaven to validate Jesus’s ministry. Lastly, the surah reminds me a little of Jesus’s parable of the Great Banquet, where the original guests declined coming to the celebration and so other people were invited instead. This surah indeed spends much of its time decrying the Jews and Christians who have failed their faiths, and are to be supplanted by Muslims, although this week we will look mostly at the laws and codes that are being laid out to define Islam as its own religion. “This day those who disbelieve have despaired of [defeating] your religion; so fear them not, but fear Me. This day I have perfected for you your religion and completed My favor upon you and have approved for you Islam as religion,” God proclaims–right after forbidding certain methods of killing meat. It is an odd placement for such a grand proclamation, but perhaps indicates that the purity codes that front-load this surah are more than little matters of etiquette. They are the guidance of right and wrong from God, and the finishing touches that set apart Islam from all other moral-minded monotheistic religions. Halaal, “permitted,” is a word you maybe hear in relation to Muslim foods, but its full meaning applies to all life choices. As such, even when this surah starts by describing permitted and forbidden foods, it also reaches out to include non-dietary permissions and regulations as well. That which is not halaal is instead Haraam, “forbidden,” and taking part of something that is forbidden constitutes sin even if it is a matter about the source of your burger. Perhaps what makes dietary codes different than other sins, however, is that restrictions can be faultlessly dropped when desperation requires it. In the case of dietary restrictions, this surah defines what is permitted by focusing on what is forbidden. Pig products and blood are defined as the two meat products that Muslims cannot eat. The rest of the dietary restrictions are more concerned with the method of killing the animal, categorizing any meat killed by a forbidden method or source as carrion. Humans cannot eat anything that wasn’t killed by a human (unless the killer was a human-trained hunting animal and God’s name was subsequently spoken over the killed prey). The fatal blow cannot be blunt-force trauma or suffocation. The animal cannot have been killed for, or associated with, anything pagan or occult. Through these limits we can see that Muslims are essentially uninhibited in what they eat, although more restricted in how they acquire their meat. While Muslims are forbidden meat that has been killed in any other name but God’s, they are explicitly permitted to eat meats that have been slaughtered by Christians or Jews, affirming that the Quran believes it shares the same God as that of the People of the Book. The difficulty with describing things using both terms of permission and forbiddance is that sometimes those things can come into conflict. This happens when the surah permits Muslims to eat food from the Jews or Christians. In the case of Jews, this is not so big an issue, as Jews only eat through the narrow parameters of kosher law, and almost all of those items fit within Islam’s halaal. Christians, however, have no dietary restrictions by doctrine, and only a few communities maintain their own traditional restrictions. This could lead Muslims to a conflict of opinion. Some might interpret this to mean Muslims can eat outside their usual restrictions when eating from Christian or Jewish tables, which would be a gaping loophole for them. 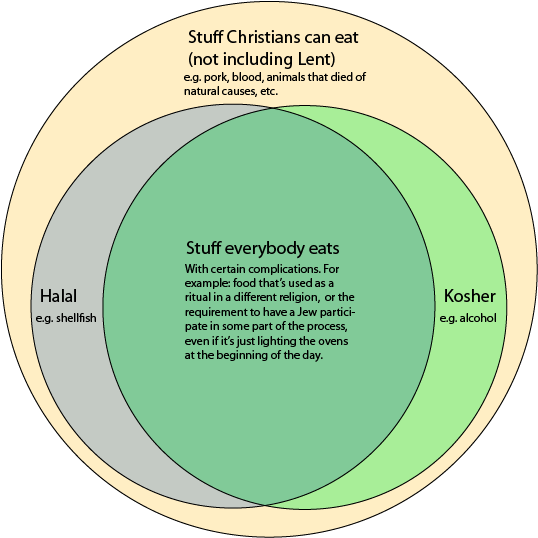 Much more frequently, however, the preferred interpretation is a Venn diagram approach, where Muslims can only eat Christian/Jewish food that has not previously been defined as haraam. We Christians are basically the tiger sharks of religious circles. None of the dietary restrictions come with any rational or symbolic explanations, not in the text itself. Gambling and alcohol, however, are linked as devices of Satan that create hatred and animosity. They have been condemned in prior chapters, but never outright abolished. I failed to mention an ayah in an-Nisa that banned drunken men from stopping in the mosque. They could pass through the mosque, but not stop and pray, since they probably wouldn’t know what they were saying. That suggested to me that drinking alcohol might be allowed, since there seemed to be surprisingly little comment about the consequences for being within a mosque and drunk. This surah still doesn’t lay a hard line or prescribe a punishment, but it questions the people why they will not give up alcohol and gambling. Since such things are placed in the same category as occultic practices, we can see that drinking and gambling are about as good as forbidden. The roots H-r-m of Haraam contain the idea of forbiddance. Things can be forbidden out of disgust, as we’ve been seeing in prior examples, but they can also be forbidden out of reverence. It can mean sacred, as in al-masjid al-Haraam, which is The Sacred Mosque surrounding the Ka’ba. Out of respect for the religious nature of the site, certain acts are forbidden there (most notably violence, even before the time of Islam). The word iHram, which is left as untranslated jargon by Sahih International, means forbidding oneself of additional things in order to go on pilgrimage. In short: consecration. The definition or ritual process of iHram is not spelled out here, but its restrictions as relating to food are. Those who have consecrated themselves to go on pilgrimage are not allowed to hunt. They can go fishing and there are no added prohibitions against domestic animals. The surah says that God tempts pilgrims with sightings of achievable game animals. Anyone who fails must sacrifice a domestic animal of equal size, as determined by two adjudicators, once they arrive at the Ka’ba (or alternatively by feeding the needy or fasting for a few days). While we are on the topic of purity, there are also rules about cleanliness and prayer. Before praying, Muslims must wash their heads, arms up to the elbows, and feet up to the ankles. They cannot pray while in a state of impurity (which has to do with recent sexual activity) and must bath their whole body to purify themselves. If no water for washing is available, as is the case in much of Saudi Arabia, then using clean sand is a viable substitute. Again, the Quran views itself as being very accommodating and states that it does not want to overburden people with its regulations. Murder. It is always exemplified in Abrahamic religions by the story of the brothers Cain and Abel. The greatest advantage of this story is that it teaches the high cost of murder. Since Cain and Abel live at the start of the human era, killing one of them has grave implications for the human race. It implies that murder is inherent in humankind, since even with all the space in the world to move to, one man decided to solve his problem by killing the other. Listeners also think of all the descendants who were not born because there was no Abel. Indeed, the concluding moral in the Quran’s telling is that anyone who murders one human might as well have murdered all of humankind. The Jewish account is a very minimal telling: Adam has two sons, one who farms and one who herds. 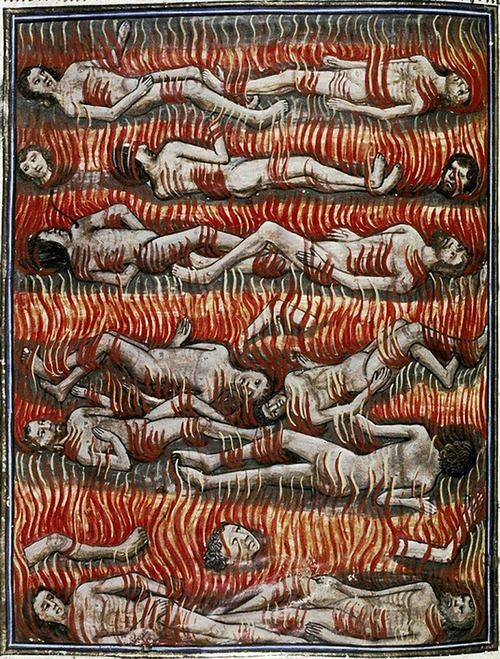 For no stated reason, God prefers the sacrifice of animal fats by Abel over the crop sacrifices of Cain. Cain is jealous and, despite God warning him of the grim nature of sin and encouraging him to master himself, goes on to kill Abel. Cain does not show remorse for the killing but despairs at the terms of his earthly punishment. The Quran does not go much differently in plot but has more dialogue. The sons aren’t named, but it’s easier for me to borrow their biblical ones. Adam has two sons, but God only accepts the sacrifices from one of them. Cain grows jealous and threatens Abel’s life. Abel explains that God accepts his own sacrifice because he is righteous. Because Abel is righteous, he says he won’t fight Cain, despite the threat, and in fact desires Cain to act so that Cain will be condemned to Hell. Cain kills Abel, but comes to feel remorse when God shames him by making a crow look more righteous in comparison (the crow tries to bury Abel’s body, which Cain had left exposed). So the main difference in the Quran version is that it is more concerned with the afterlife, whereas the Jewish telling (like most of Jewish scripture) views righteousness in this life as the means and end of itself. The story does confirm what I had observed in previous suwar that the righteous do not kill first, even in self defense. Abel’s statement about Cain’s doom in hell blurs the border between justice and revenge, and that makes me feel a little uncomfortable. Cain does come to feel remorse, although I do not know if this counts as the kind of repentance that can save him from hell. Despite the promise of hell, Muhammad is still administering a government and the Quran has to supply him with some earthly punishments in order to run society. The measurements of justice are not spelled out, but death and mutilation are given precedent as punishments. The vague categories of crime are fighting against God and His messenger, and spreading corruption. The punishments for these crimes can include execution, crucifixion, amputation of a hand and foot from opposite sides, and banishment. The famous punishment for theft is here: no matter who the thief is, chop off their hand. This punishment is explained to be a deterrent. These harsher retributions do stand in contrast with many of the ones we’ve seen before. It is notable that most of the penalties we have read so far have involved community service in the form of feeding or clothing the poor, or freeing a slave, or offering a meat sacrifice (a portion of which is given to the poor for food). In that more positive strain, the required penance for breaking a solemn oath is feeding or clothing ten of the poor, freeing a slave, or fasting for three days. Colloquial oaths are not seen as legitimate (Arabic speech is full of them) and cannot count as crimes. The surah also upholds the Torah law “eye for an eye…” etc., which is interpreted both here and in Jewish tradition as suing for money and not actual mutual maiming. It does say that the victim is free to show mercy and turn aside a punishment. All punishment, whether Hell or the death penalty, can be turned aside with full repentance. The ability of repentance to turn aside punishment is another topic that I’ve seen upset people. In western civilization, the poster-child of evil is Hitler. If there’s one person that our general culture enjoys imagining in infinite torment, it is Hitler. I once had a friend muse that he could not accept religion, because he couldn’t believe that had Hitler repented and converted before his death, God would not punish him. It does seem inconsistent that punishment is only perpetrated on those who are caught in sin, regardless of their potential to repent later in life, but that if they repent/convert before you find them then they escape consequences. This paradox is part of what informs the Catholic doctrine of purgatory, in which even those destined for heaven must still take consequences for their remaining sins. Other traditions, and maybe Islam, might instead emphasize the process of personal mortification it would take for someone like Hitler to admit their guilt and repent, and that such a process is not the same as shrugging off consequences. In this surah it also says that re-offense brings sure retribution (although I do not know if that also can be reversed by it own repentance). Surah an-Nisa, ayah 18, has already said that death-bed repentance is invalid, and other ayat have required good works to be present in order to receive mercy. So it is possible that Islam believes that some amount of penance has to be made before a repentance is valid enough to save someone from Hell. I think, for a new religion like Islam at that point in time and in that culture, the idea of a clean slate was invaluable to help the new society move beyond its old grudges and facilitate new converts, particularly when many of those converts were the very people who had been originally persecuting it. This surah spends many ayat reminding Muhammad, and the believers, that their only responsibility towards unbelievers is to notify them about Islam and to act justly. Striving to convince unbelievers is repeatedly described as futile, and God claims exclusive power to set a person on the right or wrong track. This message is emphasized to Muhammad because he is acting as more than just a messenger at this point in time –he is also the community’s chief justice. God makes clear that Muhammad’s responsibility to judge is over the believers, and that to unbelievers he is only obligated to be a messenger. If unbelievers come to Muhammad for a judgement, he can choose to decline and have no fear of being hurt by them (perhaps meaning that God will not hold him guilty for their resulting unguided actions). This blunt disavowal of responsibility might seem like the teacher who gives a student a failing grade without considering their own influence in the student’s failure. No question is leveled at how one is supposed to talk to the unbelievers except just to notify, which is a one-way interaction. This licensing of Muslims to wipe their hands of all responsibility for the guilt of others might sound a little unfair or callous, but we have to understand the Quran’s perspective and why it views this as possible. Determining individual guilt is hard because we know that it always has context, whether that be derived from accidents of poor communication, ignorance, or a burdensome environment (which includes products of our own guilt and influence). The Quran states it is fixing the first two factors because it is perfectly communicating expectations and educating people on right and wrong. Ignorance and misunderstanding are thus no longer factors tempering God’s judgement once a person has heard the Quran. Even hearing of the Quran and not listening becomes a condemning situation, since you’ve turned away from investigating guidance. Environment is still a factor that makes earthly judgement very hard. We cannot judge that a well-fed man who doesn’t steal food is inherently more virtuous than a starving man who does steal food, not unless we can see the first man starve and still refrain from stealing. The Quran believes it is fixing this too, because it instructs believers to build an environment that is just, charitable, and orderly. If all social issues are solved, then we really can see a person’s rebellion and judge their character. It is much easier to judge the rebellion of the well-fed man who steals food than it is to judge the starving man who steals food. Because the Quran believes that it has provided education of right and wrong, communicated clearly, and set up an ideal environment, it believes that it has removed all excuses for guilt, and that each individual is only responsible for their own choices. So when believers are told that they have no obligation to unbelievers except notification, it is because they are understood to be already doing everything that could be done. They should be building/have built the perfect environment for righteous living and striving to see that environment expanded by calling new members into it. Coercing or convincing people to join is not their responsibility, since the truth should be self-evident. If Muslims fail to make this truth self-evident by following and embodying the teachings of the Quran, then they are held accountable for that. Islam sees itself as a buffet that is set and on display, and that those who do not listen and continue to starve have only themselves to blame. I am trying to evaluate how complete the Quran is within its own teachings and how many questions it leaves unanswered. I think that even as it was being revealed, there were believers who were unhappy or confused with the Quran’s teachings. One ayah discourages the believers from asking difficult questions. It says that if they ask while the Quran is still incomplete, then their answer will be delivered and then they’d have to live with it. (I suppose the situation is much like that of the yellow cow. In that story, the Jews kept asking God for more and more guidance until they were pinned to a very specific and difficult-to-follow command.) That this ayah was discouraging questions surprised me. So far, the Quran has been very inviting of questions, directing believers to look at nature, use reason, and ask God and the Prophet for guidance. I haven’t spent much time collecting the passages that demand using reason and nature to draw conclusions about God, but they are there. In stark contrast, ayat 101-102 say that people should not ask for knowledge of difficult things, and admits that some people have become disbelievers as a result of things revealed. It is only a little blip of a message, but one that surprised me in light of prior patterns. So the long section on crime and punishment today doesn’t seem quite within the topic of “the feast” that I’d set up in the beginning of today’s post. But hey, it’s the Quran, and the only organizing themes are the really big ones: Mankind under God, Mankind towards each other. Next week I’m going to look at the material that further denounces those who were first invited to the feast, O People of the Book.